With an indoor salt swimming pool and a fitness center , Renaissance Suzhou Hotel caters to business travelers, families, couples-to-be and in-the-know locals with select amenities, comfortable accommodations and an array of dining options in Suzhou Industrial Park.Overlooking the tranquil and lush Central Park,the hotel is only steps away from the exciting shopping and fine dining area. 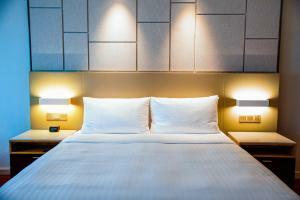 The hotel offers free onsite parking and free WiFi. 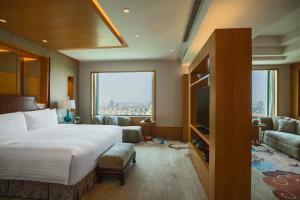 Renaissance Suzhou Hotel is 300 metres away from Central Park Subway Station (Exit 2B), which is 3 stops from Eslite Bookstore and 2 stops from Pingjiang Street. 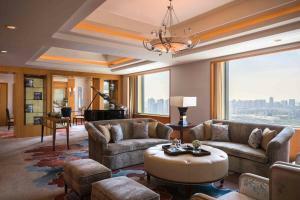 The scenic Jinji Lake waterfront is a 5-minute drive from this property. It is about 65 km from Hongqiao Airport. A short several minutes' ride can put you in the heart of museums and temples. 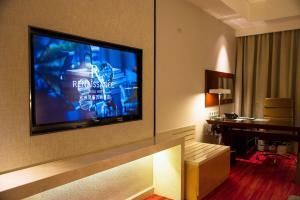 Designed with a local touch, rooms at Hotel Renaissance Suzhou are equipped with a satellite TV. 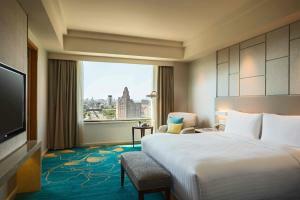 City views can be enjoyed from each room. 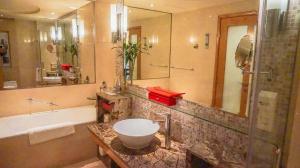 The en suite marble bathrooms come with a large bathtub and premium toiletries. For your comfort, bathrobes and slippers are also provided. The hotel features laundry services. Guests can enjoy a free shoe shine service. A 24-hour fitness centre with a sauna room is provided.The property boasts a multi-functional event area fully equipped with audiovisual system. Self-service laundry is also available at this hotel. Food Studio serves fine continental cuisine. Wan Li Chinese Restaurant features traditional and innovative Chinese cuisine with 4 private dinning rooms. 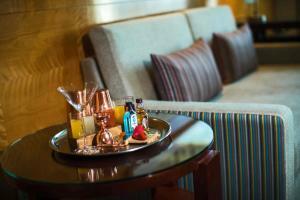 Mediterranean cuisines and drinks are served at R Bar. 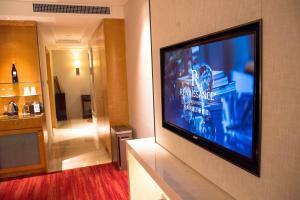 Guests are entitled to enjoy the access to the executive lounge. This room is located on floors 16 - 20. 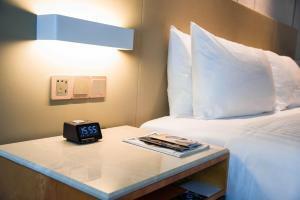 Located on 4th-13th floors, the room comes with a flat-screen TV, a minibar, a safety deposit box and ironing facilities. The en suite bathroom has a bathtub and shower facilities. 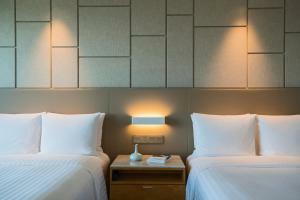 Rate: CNY 599.00 ... CNY 2332.00; select dates below to get current rates. 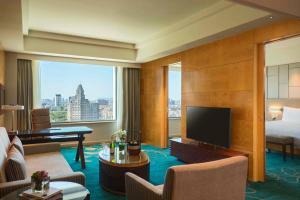 Located on 10th - 20th floors, this suite features air conditioning, satellite TV and bathrobe. 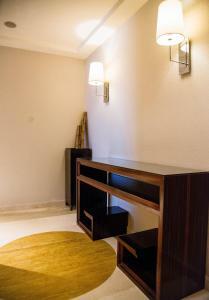 Located on 4th - 13th floors, this twin/double room has a electric kettle, sofa and tile/marble floor. 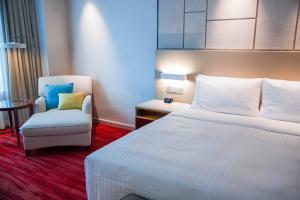 This double room features air conditioning, bathrobe and tile/marble floor. This room is located on floors 16 - 20. 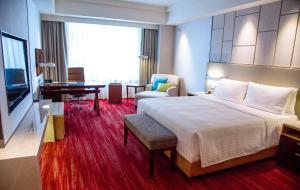 Located on 14-15th floors, this double room has tile/marble floor, bathrobe and minibar. Room features an air purifier. Rate: CNY 855.83 ... CNY 2094.21; select dates below to get current rates. This suite features a dining area, tile/marble floor and bathrobe.